I propose a syntax plugin to mark a point in a wiki page for improvement. This is a bit like the current FIXME magic replacement, but for cases where the current editor wants to draw another specific user's attention to the page so that they can make an edit using their particular knowledge. I realize that in a public wiki this might be less useful, but in a team wiki the application is hopefully obvious. 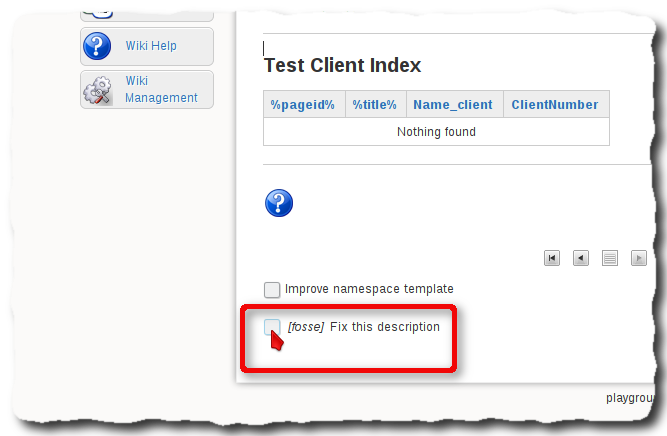 to output a list of pages where Some.User has been FIXME-tagged; this should default to the logged-in user. Thanks turnermm. I probably should have mentioned in my original post that I'm already using the Publish plugin. It is excellent, but as far as I can tell, it doesn't meet my requirement here. I use Publish to show which pages have been approved by a designated group of approvers vs. those which haven't, but I'm not sure how I would use it to call a particular user's attention to a particular section of some page or other. Not quite the same, but this reminds me of the do plugin. Thank you turnermm and ach for these suggestions. I really appreciate the help! I hope to have time to evaluate them fully next week. I wasn't aware of either plugin until your respective suggestions. At first glance, I think the do plugin might be closest to what I'm looking for, since it has the ability to output the list of pending tasks. The todo plugin does just that. After which someone can click on the checkbox to mark as done - or remove the tag. NOTE: the example shot just displays all todos, it's easy to have todos displayed by status or assigned user.